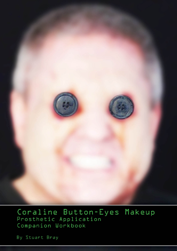 Well, finally the last Coraline makeup video is here – and editing this made me recall how much fun I had sticking this thing on! Paul Ewen who wears the piece is a joy to work with – he is no stranger to wearing prosthetic makeup and he really gets into character. If you’ve ever been accosted by a creature at a UK IMATS, there is a fair chance Paul was underneath the makeup and costume! I put together a free 11 page downloadable workbook for you to accompany this video. Click on this link or the image to the left to go straight to it. On there you will find a transcript of the voice over, step by step images and a list of the materials and suppliers I used. That way, by seeing, hearing & reading the information, you’ll get as thorough an explanation as I can deliver without actually being in the same room as me! If you have any questions about alternative materials in your area, please get in touch. You will find an extensive worldwide supplier list in the first (and free) module of the Awesome Latex ecourse which is available here. I also would like to mention I had help cleaning off the makeup by the delightful Hannah Keech – so Hannah & Paul – thanks for helping me out and for your patience. Your videos contain so much info! They are better and better! Thank you so much for your time!And looking forward to the next one! I had a lot of fun with this series! I allready bought your Awesome Latex Ecourse. And yes, it`s great! Even if it`s faster to do a gelatine prosthetic with a two-parted mould. Every time I`m using gelatine I have problems with blending the edges. I`m using the fluid of “Kerling” http://shop.kerling.de/product_info.php?products_id=298 – but I think it should work better. Or I do something wrong…. When using alcohol activated colors (Stacolor in my case) the first wash washes of when I`m applying the second wash. wash wash wash…. Some weeks ago I´ve sent you an email about the unpredictable “chaos” of wounds. Haven`t get an answer, maybe because of vacations. Would be nice if you can take a look. Thanks for watching, and thanks for getting the ecourse and supporting me! I am glad you like it. I have a hectic family life so that is the main reason for any delay with anything here. I will email about the wounds and randomness. With the Stacolor (great colours in those palettes) as with Skin Illustrator, the trick is to lay some colour down with a single dab and then move onto a new area, allowing the previous to dry. It is the combination of friction of the brush with the alcohol with agitates and then removes the previous layers. After all, you are constantly reapplying the very solvent which activates it. The brush really needs to come down onto the surface once and then move on to somewhere else so the patch applied can evaporate thoroughly. Flicking colour also works, as there is no actual contact with the brush and the surface, and it lands like rain without any friction to agitate it to removal. You could try heating the solution and adding salt (maybe salted water will do it) and apply it as a heated liquid as suggested by Jeffrey. Bear in mind the edges still have to be pretty good – you cant melt away a bad edge. Bad edges can be snipped with scissors from the back prior to application, or melted before applying using a heated metal tool such as a spatula, sculpting tool or even the handle of a small spoon. Thank you so much for commenting and keeping the blog alive! Great stuff. In 1992 I was 19 and starting my college degree, trying to get to the point where I could help you, Paul! Very well done and thanks so much for all the information. If you use very warm Witch Hazel, it will dissolve gelatine edges quicker and better than cold. And, a fresh bottle tends to work better than old stock. As far as how to warm the Witch Hazel, an electric “Coffee and Tea Warmer” works quite nicely. These can be found at most department stores, nowadays. They are also now commonly used for heating potpourri. So, you may be able to find the in many arts and crafts stores, too. Place the Witch Hazel in a glass or metal jar, (do NOT use a plastic container, the tea warmer may likely MELT it), and place on the warmer. Within a few minutes, it will be nice and warm, ready to use. To increase adhesion apply your preferred adhesive to BOTH the skin, and the back of the appliance. Powder, when dry. Then place the appliance in place. You can now reactivate the glue by carefully brushing 99% Isopropyl Alcohol under the appliance. Wait a second or two, then press gently into place. This makes it easier to apply, (especially with larger prosthetics). And when the glue is reactivated, it remaining powder residue between the layers of glue actually increase adhesion, by increasing available surface area, (on an almost microscoping level), that the glue can then stick to.